Can someone here explain to me how the thermostat flow water to the carbs. I dont get it when I look at the drawings. If I remember correctly there are two connections at the bottom of the thermostat housing. One is the thicker return to pump the other is the carb heating circuit. That circuit go through the carbs and more or less connect to the same place as the return hose. But as far as I can see there are no regulation between the two. Is it regulated based on the the thickness of the tubes and that alone? In addition, it looks to me as if the thermostat close the bottom end of the housing by default making it a loop with start and end at the pump inlet side. Of my two SH , for which I have 4 sets of carbs, best I can tell the carb coolant passage has never flowed coolant since I have owned them. I spent many hours chemically, mechanically and hours in my industrial sonic tank trying to clean the passage up just to see if coolant flow made a noticeable difference..It did not for me, not on a Dyno, not in seat of the pants testing. Weather it is intended to be a carb heating or carb cooling is up for debate, as Honda aint saying..Ive asked..in English and Japanese Of the many responses I received back, only one was more than we can not/ dont answer those questions. The engineers for that model are no longer available. Bottom line, carb coolant lines have been deleted by a lot of us with no notable downside. Almost everything else have been checked out. The rear cylinder cut out after a period in rain, but the plug has been changed, the coil and cable has been changed, the sensor cable has been checked the plug well is dry. And when it cut I can stop or even idle for a minute or two and it suddenly and very abrupt run on both again. Pushing the engine hard on one sylinder will cause the second to missfire within a minute or two and halt as well. The problem very often occur right after a give a bit extra throttle:. All these symptoms are pointing to icing and I am familiar with carb icing from old cars in this cold country. Especially when so many other things have been checked out. A want to give the ECU and igniter modules some better weather protection but that's more a preventive action. They would not dry up in seconds in cold weather as spark plug og indeed icing can. Under the assumption the OEM did not waste money to develop and then produce the carb coolant line system (Which Honda calls a "carburetor heater" in the service manual) ....they did so for a engineering reason that solved an issue. 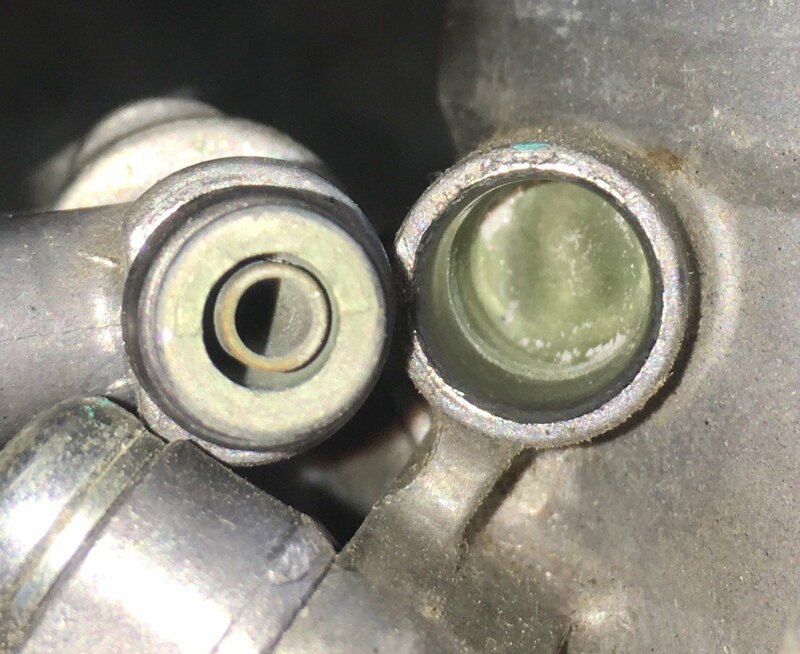 It may be that in one very specific set of conditions the carbs ice and the heated coolant was the needed fix... Those specific conditions are so rare, most never come upon them and have an issue even though the coolant flow has been blocked, or the system removed. The "water joint set" JOINT SET 16026-MBB-640 which seems to always be blocked is available new ...Pick up two of those, one for each carb. Some good silicone hose to interconnect them and silicone hose clamps, and then new hose to the thermostat. Last edited by E.Marquez; 08-29-2018 at 05:27 AM. opened up a 4th set of carbs I had and found something I’d not seen before... coolant joint clean and open. I replaced the joints. The originals were blocked. The others were nice and open. Carbs now get som heating. Hoses get warm (ish). And the first test ride were a success. No misfiring, no problems. I would love to conclude that this was the solution but in all fairness, I relocated the breather and overflow tubes as well as they were sticking out behind the cat killer. Now they are hidden inside the cat killer to avoid clogging by water.. This has been reported to give the same symptoms. What I will do next time it rains is to pull them out again and see if that change things. I blocked off (deleted) the carb heating on my VTR way back in 2000 or so. Never an issue. My guess is this only helps in particular weather situations that are rare.